MyMemories Blog: Meet this week's Featured Designer! It's *Fly Pixel*!! Meet this week's Featured Designer! It's *Fly Pixel*!! Good morning and Happy Monday!! It's time to show off another MyMemories Featured Designer! This week it's Ulisa from *Fly Pixel Studio*!! 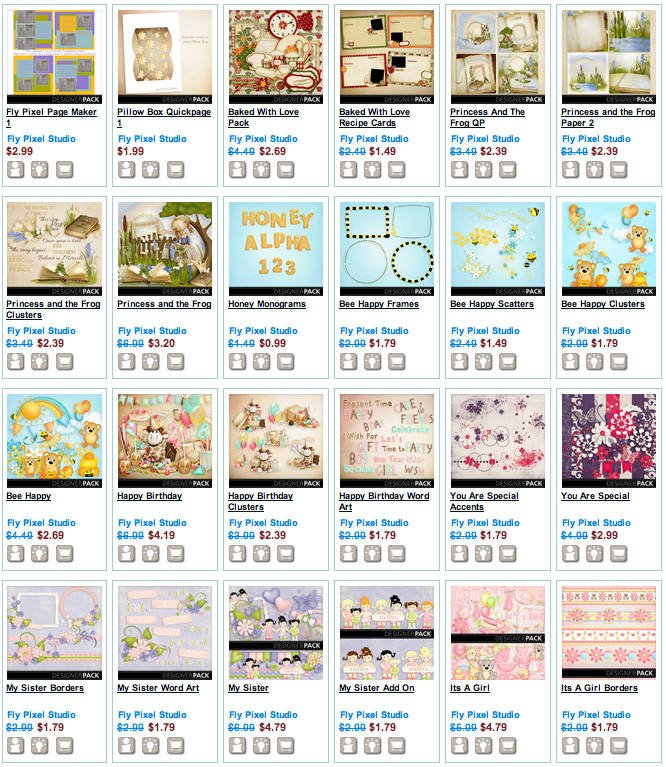 She has some amazing goodies in her shop and we want to show them off! Her WHOLE SHOP is on sale, so if you have some Pixel goodies on your wish list - THIS is the week to pick them up! In addition to designing, I love new things, classical music, ballet, flowers, reading and cats. to her shop at MyMemories.com! You do NOT want to miss out! Comment below and tell her what YOUR favorite kit is - the two LUCKY DUCKS will be posted next Monday, so don't delay... COMMENT TODAY! Wow!Wow!Wow!...I Just Adore Your Designs!...They're Just Gorgeous & Outstanding!...Congratulations!!! On Being Featured!..Trying To Pick Just One Favorite Is Difficult,Indeed!...I Just Love "Heavenly Touch","Precious Moment" & "A Bouquet For Mom" But My All Time Favorite is "Togetherness"...I Just Adore Those Kitties & All Those Hearts!...I Would Just Be So Thrilled To Win!...What A Grand Day That Would Be Indeed! Your designs are beautiful! I love love love the princess and the frog stuff- and there are no little princesses in my family! Only princes! But I am sure I could find a niece or sister to do a page with these beauties! Love them! all your pages are super! I like the pink Delicate Pack. What a great chance to win. Thanks! Oh my goodness, i LOVE the princess and the frog kit. SO cute! You are a very talented designer. I love all your designs. I've used several many times. But Elegant and Princess are two of my favorites. Christmas Cooking is my favorite but quite honestly all of your kits are wonderful! I love smile and joy and used it many time alredy. Thanks for all the wonderfull kits. All of your designs are too stinkin' cute!! My favorite would have to be the "Bee Happy" kit! So, so cute!!! Thanks for this amazing chance to win and for all of your super cute kits!! I love the Jungle Adventures Kit! So bright and colorful! I love your kits!!! Baked with love looks like it would work for some photos I have with from baking with my daughter last month. Thank you for the chance to win. I love the Happy Birthday kit. It is perfect for my daughter's birthday next month. My two favorites are Bee Happy and Baked With Love. Since I'm making a scrapbook of family recipes for my children, neices and nephew for Christmas complete with photos of them "helping" in the kitchen during several holidays when they were younger, I guess my favorite would have to be Baked With Love. Love love love the Halloween and Christmas stuff...Bootiful night is so CUTE!! Love it!! Julia has some beautiful kits. My faves are My Sister and One Miracle Night. I love all of your designs. My favorite right now is the Baked with Love pack. My favorite kit is You Are Special! I love the color combo! Thank you so much for the chance to win! If I had to really really choose one - it will have to be 'The Perfect Moment' as it is so elegent and would be wonderful for a wedding scrapbook and for cards and notelets to your other half! What a gorgeous selection you have - i'd have them all if I could! I love the You're Special kit... I especially like the colors in it. Thanks for the opportunity to win. Such beautiful kits! I love the Princess and the Frog kit. Thank you so much for the chance! I love Baked With Love. I am always baking for someone and would love to have this kit to make labels. Thank you for the opportunity. Your kits are so unique. The whimsical designs and awesome color combos coordinate perfectly. Explorer is great - as usual. Thanks for the chance to do some "free shopping". Oh my! All your designs are absolutely gorgeous! But... I love, love, love Birds and Apples! Thanks for the great giveaway opportunity! I just love Bee Happy! But they're all beautiful! Beautiful designs! My favorite is The Perfect Moment Photobook. Baked With Love- delightful combination of colours and beautiful designs. Perfect for capturing kitchen memories. I love the beautiful designs! Absolutely gorgeous!! Thanks so much! I love the Bootiful Night Pack and the Happy BIrthday Kit!!! Everything is so darling! Hi, your design is fabulous, love all!!! Happy birthday is my favorite!! Love all them, but Baked With Love is my favorite. You are truly a talented lady!! Love your kits. More pretties and lovelies at MMs. Your style seems peaceful to me. I really do like it.